My edition: Paperback, published in 2014 (originally in 1962) by Pushkin Press, translated by Laura Watkinson, 508 pages. Description: It is the dead of night. Sixteen-year-old Tiuri must spend hours locked in a chapel in silent contemplation if he is to be knighted the next day. But, as he waits by the light of a flickering candle, he hears a knock at the door and a voice desperately asking for help. A secret letter must be delivered to King Unauwen across the Great Mountains – a letter upon which the fate of the entire kingdom depends. Tiuri has a vital role to play, one that might cost him his knighthood. As a child I was always immersed in a book, but more often than not it was written by a British author, such as Roald Dahl, J.K. Rowling or Enid Blyton, not a Dutch one. That isn't to say that there weren't any good contemporary Dutch authors around at the time, as I certainly was a big fan of Paul van Loon and similar writers, but none of them felt quite as as epic and exciting as the translated books I adored so much. Five notable exceptions that were written by Dutch authors are: Crusade in Jeans (Kruistocht in spijkerbroek) by Thea Beckman, To Be King (De koning van Katoren) by Jan Terlouw, The Little Captain (De kleine kapitein) and The King of the Copper Mountains (Het sleutelkruid) by Paul Biegel and The Letter for the King (De brief voor de koning) by Tonke Dragt. These were the novels steeped in adventure and historical or fantastical places, transporting me with the flick of a page to imaginative lands filled with heroes, villains, and everything in between. I'm always astounded when incredible novels not originally written in the English language are never translated for the foreign market, or if they are it takes many years to get there. 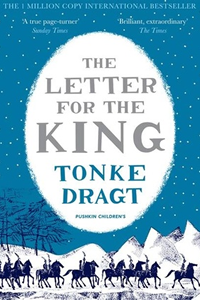 The Letter for the King is an exemplary example of this, as it was originally published in the Netherlands in 1962, yet only received its English debut over half a century later in 2013. It is a shame that non-Dutch readers have been deprived of this children's classic for so long, but as it is a timeless story it will undoubtedly collect a whole new legion of fans that now have access to this incredible book. Set in a fictional medieval land, 16-year old squire Tiuri is on the cusp of becoming a knight in the Kingdom of Dagonaut. All that is left for him to do is spend the night in perfect solitude in the local chapel with his fellow squires and the knighthood is his. However, in the middle of the night the sound of someone knocking ruptures through the silence within the chapel and when Tiuri against better judgment opens the door, he's given a sealed letter which he is told must be delivered to a black knight with a white shield as a matter of great urgency. Tiuri understand that it is of grave importance that he does as the stranger tells him and he sets off to find the knight to deliver the letter. I first read The Letter to the King when I was a child myself, probably 10 or 11 years old, and despite having not revisited it in decades as soon as I opened the book, the Kingdoms of Dagonaut and Unauwen came back to me as if I'd once visited myself – and I don't just mean in my imagination. Tonke Dragt has build an incredible world for the story to take place in, one that is filled with quirky and interesting characters, exciting places such as The Rainbow River and the Wild Wood and a damn good story to hold it all together. The book is rooted in our medieval times yet mixed with fantastical elements and peculiar sounding names that elevate it above a purely historical novel to the kind of fiction that you can easily lose yourself in. It will also make you wish these faraway places were real as they are way more exciting than anything that has ever happened in our own world! Tiuri is a fantastic protagonist to carry the story; the focus may be on his mission to deliver the letter and the exciting adventure he goes on, but this is very much a coming-of-age novel of a simple squire growing up – and defying all odds to become a true hero in an epic tale that belongs amidst the literary greats in the fantasy genre. The Letter for the King is a classic in the Netherlands for a reason, winning not only a slew of prestigious prizes (including book of the year in 1963), but remaining a firm favourite on children's and adult bookshelves 50 years on from publication. It's an incredibly captivating and intriguing adventure story that is just as engrossing reading it as an adult as it was when I first discovered the Kingdoms of Unauwen and Dagonaut as a far more impressionable child. And the sequel, The Secrets of the Wild Wood (Geheimen van het Wilde Woud), received its English publication debut this month – needless to say I am thrilled to return to Tiuri's world soon and discover what incredible adventures Tonke Dragt is sending our hero on next! Many thanks to the publisher for providing a copy of the novel in exchange for an honest review.